Jìngwǎn (靜琬) was a devout monk who flourished in the early 7th Century and died in 639 CE. He was abbot at the Temple that Dwells in the Clouds (雲居寺) or Yúnjū Temple, on a low peak called Fángshān (房山) or Repository Mountain (In Middle Chinese 居 means a room or alcove, or any space where something is housed). Fángshān is about 65 km south-west of central Beijing. Although his origins are obscure, we remember Jìngwǎn because he undertook a project to carve Buddhist sutras in stone to preserve them against what he saw as the imminent end of Buddhism. Jìngwǎn and his many followers over centuries created a huge repository of Buddhist texts on around 15,000 stone tablets stored in caves in the nearby ridge, originally called Mount White Stripe (白带山) because of a stratum of white chalk that can be seen in the cliff faces. It is now called Stone Sutra Mountain (石經山) for obvious reasons. The tablets provide important insights into Buddhist texts of the period (several periods in fact) and are part of a bigger story about Buddhist practices in medieval China. At that time, Táng lín was one of two Vice Presidents of the Censorate (御史臺), the branch of the imperial government charged with monitoring and tackling official corruption. They reported directly to the Emperor and were thus very powerful. His collection of stories, the Míng bào jì, was published in English translation by Donald Gjertson (1989). Táng lín records that he visited the region of Yōu zhōu (幽州) in 645 CE and spoke to locals who told him about Jìngwǎn, but that he didn't see the Temple itself "because of the military situation [軍事]" (Gjertson 1989: 166). Táng lín actually refers to "the monk Zhìyuàn (沙门智苑) of Zhìquán Temple (智泉寺) in Yōu Zhōu (幽州)" (c.f. Wikisource), but it is widely agreed that this story must relate to Jìngwǎn (靜琬) at Yúnjū sì (雲居寺). As far as I can tell, there is no Zhìquán Temple and never was (though funnily there is a modern temple in Japan, which uses the same Kanji but pronounced Chisenji). Jìngwǎn is sometimes linked to another millennialist monk, Huìsī (慧思), the third patriarch of Tiantai Buddhism. For example, Li Jung-hsi (1979), Lewis Lancaster (1989), and Yong You (2010) all state without qualification that Jìngwǎn was a disciple of Huìsī and had lived at Zhiquan Temple. However, the first mention of such a link comes from the Ming Dynasty, in Liu Tong's guide to the Capital, 帝京景物略 (Dìjīng jǐngwù è) or A Summary of Things to Admire in the Imperial Capital, published in 1635. Huìsī died in 577 and it's not known when Jìngwǎn was born. It's not impossible that they met, but Jìngwǎn died 62 years after Huìsī. Had Jìngwǎn been a student of Huìsī, he'd have to have been a monk already and thus probably in his teens by then. We are not sure where he lived prior to his appearance at Yúnjū sì, but the temple itself is in the region that was controlled from 550 to 577 by the Northern Qi (北齊) during a time when China was divided into a number of states. In 574 Emperor Wu (武帝 543–578) of the neighbouring Northern Zhou held a debate between Confucianists, Daoists, and Buddhist and decided that the Confucianists had won. As a result, he banned both Daoism and Buddhism, appropriated the considerable wealth and property of Buddhist temples and returned monks to lay life. In 577, Wu of Zhou made an alliance with the Göktürks (Blue or Celestial Türks) and conquered Qi, reuniting the north into a single state. The records of the Northern Zhou are the first to refer to the nomads living on the steppes to the north of China as Türks, although nomads had lived there for centuries. The word they use to represent Türk is 突厥, probably pronounced in Middle Chinese like duot-gwut (IPA duət̚-kʉɐt̚). The Türks would continue to play a decisive role in Chinese and Central Asian geopolitics for the next few centuries, while their cousins from Central Asia would go on to take the modern territory of Turkey from the Byzantine Empire and call it their own. Wu died suddenly in the summer of 578. The shrewd political operator Yáng Jiān (楊堅) became, first regent, and then, in 581, Emperor of a new Dynasty, styling himself Emperor Wen of Sui (隋文帝). Wen still faced an ongoing series of rebellions from within and threats from the increasingly organised and aggressive Türks in the North. Despite this, he impressed people as a hard-working administrator. He reorganised the state, standardised coinage, and began a series of infrastructure projects such as canals connecting major rivers to facilitate trade. Notably, Wen was born in a Buddhist temple and raised in his early years by a Buddhist nun. As Emperor, he promoted Buddhism as the state religion, thus undoing some of the damage caused by Wu. He reigned until 604. The second Sui Emperor, Yáng (隋煬帝), embarked on a series of disastrous military campaigns against the Kingdom of Goguryeo (or Koguryǒ) which had been encroaching on Chinese territory. Goguryeo was in what is now North Korea and also had its capital in Pyongyang. Yáng also faced major incursions of Türks from the north, as they also found political unity in their identity as the Göktürk Khaganate. Yáng drafted men for his armies and this led to a shortage of labour for farms and drops in agricultural production. Worse, Yang was a hedonist who squandered wealth on luxuries. Rumour was that he had murdered his father to get to the throne. In 617 the aristocratic Lǐ (李) family from what is now Shanxi province were deeply unhappy with the situation. Turks and Koreans were increasingly a problem in the north and rebellion amongst the people looked increasingly likely. Lǐ Yuān 李淵 and his two children led an insurgency that soon captured the capital. They forced Yáng to retire and installed the thirteen year old Yáng Yòu (楊侑) as Emperor Gong of Sui (隋恭帝). However, in 618, after just six months, Yáng's own minsters strangled him, at which point Lǐ Yuān forced Emperor Gong to step down and install him as the Emperor of a new Dynasty. Lǐ Yuān became Emperor Táng Gāozǔ (唐高祖). The new dynasty name, Tang 唐, referred to the Lǐ family's original fiefdom. The first Tang Emperors inherited a unified China, but one still wracked by rebellion and external threats. It took them a few decades to establish peace and prosperity. Even then the Tang era was marked by extraordinary events such as the first and only female Emperor (the Chinese term 帝 is not gendered) and large scale rebellions. During this period Xuanzang travelled to and from India and then Tantric Buddhism arrived with Śubhakarasiṃha and Vajrabodhi. The Tang capital, Changan, was the largest city in the world and, as one end of the Silk Road, was also vastly wealthy (though such wealth was very unevenly distributed). The wealth of Buddhist temples in Tang era Changan was said to be "incalculable" and must have seriously distorted the Tang economy as they paid no tax. The later Tang era also saw renewed persecution of Buddhists and confiscation of their property. Prophecies of the decline of Buddhism continued to fuel the imagination of Buddhists in East Asia for centuries. And to understand Jìngwǎn we need to understand a little more about these prophecies. For Jìngwǎn, who lived in the North of China, less than 100km from the Great Wall, peace and prosperity were likely in short supply for much of his life. In addition to witnessing the rise and fall of the Sui (581-618) he had become interested in the Chinese Buddhist doctrine of the three ages: the age of the true Dharma (正法), the age of the semblance Dharma (像法; when people go through the motions, but do not attain liberation), and the age of the end of the Dharma (末法). The last is pronounced mòfǎ in Mandarin but is perhaps better known in the West by its Japanese rendering mappō. During the last period, the Dharma gradually disappears until nothing is left. It was only at the end of this cycle that the new Buddha, Maitreya, would appear to rediscover the Dharma and begin the cycle anew. This idea of an age of decline is the subject of the book Once Upon a Future Time (1991) by Jan Nattier, based on her PhD thesis. Nattier notes that there is no Indic term corresponding to 末法 or mappō. Indian Buddhists certainly discussed the Dharma having a strictly limited lifespan, originally 500 years. However, as with other forms of millennialism, when the 500 years were thought to be up, the figure was extended to 1000 years and, when that time approached, to 1500 years, and so on. Despite this notion of a fixed term for the Dharma, Indian texts only mention two periods: the period of the Dharma and the paścimakāla "after time" (which is usually translated as 末世). 末法 is a Chinese coinage with no Indic counterpart. The three ages doctrine is thus distinctively Chinese and only emerged in the 6th Century. The Chinese concept of the decline and end of the Dharma was very influential in medieval East Asia. Those who saw themselves as cut off from liberation through awakening, were very creative in thinking of other ways to be liberated, especially via the Pure Land idea of the intervention by Buddhas from other universes. The doctrine of the three times had a huge influence on the development of the Jōdo Shinshū school founded by Shinran. It also affected Nichiren Buddhism and via that the Soka Gakkai movement. Together these three schools make up a significant proportion of the modern world's Buddhists. One of the most important sutras for this apocalyptic vision of decline in China was the Mahāsaṃghata Sutra or Mahā (大集經; T 397), also known as the 大方等大集經 [Mahāvaipulya-mahā]saṃnipāta-sūtra (Yong 2010: 130; Nattier 1991: 114). This was translated by Naredrayaśas in 566 CE. Within this collection of sutras we find the 月藏分 Candragarbha-vaipulya-sūtra and within that, a section on the decline and destruction of the Dharma (法滅盡品). For those Buddhists who took the three ages doctrine to heart and concluded that they lived in an age of decline and disappearance, the idea had a profound effect on them. Despite the gloomy tone of his messages to posterity, however, it would be a mistake to characterise Jìngwǎn as pessimistic. To be sure, he understood himself to be living in the age which would see the complete destruction of Buddhism, but his response was in many ways optimistic and heroic. He decided that he would carve important sutras in stone for posterity. Having done this, he conceived of the far grander project of engraving the whole of the Buddhist Canon (as it was in those days) in stone. 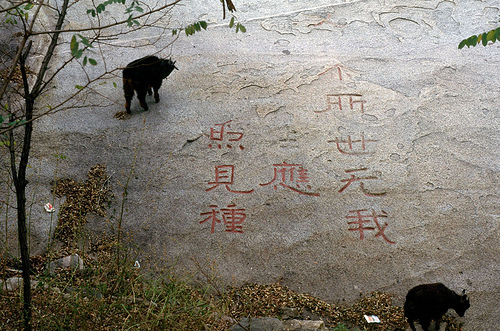 inscription on Mount Tai, Fall 1995. The practice of carving sutras in stone began around 550 CE, with large outdoor carvings like the partial Vajracchedikā Sūtra carved at Mount Tai (泰山) in characters 40–50 cm high. 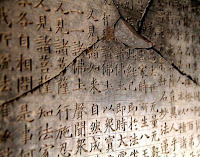 Other collections of stone sutras are found in Shandong and Henan provinces. However, the collection at Fángshān is the most extensive by a wide margin. Some (later) accounts explain that Jìngwǎn founded Yúnjū Temple, possibly for the express purpose of continuing the stone sutra project. However, since temple construction was controlled by the government, this seems unlikely. Other accounts suggest that the Temple was founded somewhat earlier, in the 550s. We don't know the exact year Jìngwǎn began his project, but Táng lín says that it was in the Daye (大業) period, i.e., 605-616 CE (Gjertson 1989: 165). One of his first tasks would have been extending a natural cave in the nearby ridge now called Stone Sutra Mountain. This became the eventual repository for the first batch of sutras. Depending on how much help he had, we can envisage the sutra engravings might have begun at the same time. The stone for the tablets came from a quarry to the south, near the modern-day town of Gaozhuangcun (高庄村), which until recently was still producing fine marble. Industrial approaches to quarrying caused pollution, however, and the quarry has been shut down and there are plans to make it into a tourist attraction. The preparation of the stone slabs for engraving was carried out at another nearby monastery (no longer extant and not named in sources). Next, an expert calligrapher would brush the text onto the surface of the stone. Then, an engraver would have carved the characters. Often the "calligraphy" of Chinese inscriptions is of considerable interest to experts and aficionados (this is very much the case at Mount Tai). All of the actual work was carried out by lay craftsmen, under the supervision of monks. And note that even a small stone tablet like the Heart Sutra commissioned by Yáng Shèshēng (楊社生 ) would have cost a lot more than any of them earned in a year for making stone tablets. According to Táng lín, in 611, the Emperor Yáng and his retinue were on tour in nearby Zhuō county (涿郡). Yáng was probably planning ahead for his invasion of the Kingdom of Goguryeo, which occurred in 612. Xiāo Yǔ (蕭瑀), a high ranking official and younger brother of the Empress Lady Xiāo (蕭氏) heard about Jìngwǎn's project. A devout Buddhist, Xiāo used his influence with his sister to arrange for a large donation to the project (as now, funding for projects was crucial). Li Jung-Hsi describes the donation as "1000 rolls of silk and other valuable goods" (1979: 106). The Xiāo's were descendants of the (Southern) Liang Dynasty Imperial family (502–557) which was still both rich and powerful (as indicated by Lady Xiāo's becoming Empress). Bolts of silk often functioned as currency for high-value transactions. A bolt of silk was worth about 1000 standard copper coins. The brother and sister also inspired many of their peers to make donations. Overnight Jìngwǎn became extremely wealthy and just five years later, in 616, the initial phase of Jìngwǎn's vision was complete. Léiyīn Dòng 雷音洞 or Thunder Sound Cave is a minor marvel. The ceiling is about 2.5 metres high, and the walls are all different lengths (10.07 x 7.66 x 11.82 x 8.3 metres). The frontage is actually a constructed stone wall. Four pillars support the roof and are decorated with images of Buddhas accompanied by their names (from a sutra listing the names of 1000 Buddhas). Lining the walls in two or three registers, are 147 stone slabs with 19 texts, many of them extracts. Complete copies of the Saddharmapuṇḍarikā-sūtra (T 262) and the Vimalakīrtinirdeśa (T 475), both in Kumārajīva's translation, are prominent and together these two take up half the wall space in the cave. Lee notes that the Xiāo family were famously devoted to the Saddharmapuṇḍarikā-sūtra and speculates that they may have had some influence over the choice to complete it first and to give it the most prominent place in the cave (2010: 56). Amongst the other complete texts found in the Thunder Sound Cave are the Prajñāpāramitā-vajracchedikā (T 236; tr. Bodhiruci) and the Śrīmālādevī-siṃhanāda-sūtra (T 353; tr. Gunabhadra). Gjertson notes that Xiāo Yǔ was also especially devoted to the Prajñāpāramitā-vajracchedikā (1989: 183). Most of the other texts are very short and include sutra extracts mostly focussed on practical matters such as ethics and monastic etiquette. Thus the cave represents a kind of samuccaya or anthology of Buddhist texts important to a Chinese monk living in the early 6th Century, albeit with some possible influence from his sponsors. It is a valuable snapshot of Buddhism in that time and place. Lee suggests that Jìngwǎn had "brought together for the first time two strands of Indian Buddhist thought that had been introduced to China in previous generations", i.e., Madhyamaka and Yogācāra. I'm doubtful about this. Both of these post-Abhidharma schools of thought were primarily śāstric rather than sūtric, i.e., based on commentarial literature by Nāgārjuna and Vasubandhu, respectively. The distinctions between the schools are not based on different sutras, but in different hermeneutics and exegetical strategies for reading the same sūtras. Moreover, these Indian categories were not so influential in China, which inherited a range of texts from the outset. Distinctions between schools were only nominal in China. Lee also suggests that the 判教 Pànjiào or doctrinal classification systems, a number of which predate Jìngwǎn by centuries, might have formed part of the context. Again, I'm not sure that this is doing anything more than stating the obvious: i.e., that the Chinese were struggling to make sense of the bewildering variety of texts emerging from India (and also from China!) which often appeared to contradict each other. That said, Jìngwǎn's choices for the Leiyin Cave were idiosyncratic, as is demonstrated by the different choices made in other stone sutra collections at Xiǎngtángshān (響堂山) and Dàzú Shíkè (大足石刻) (Lee 2010: 59 ff.). The latter is focused, for example, on the theme of the end of the Dharma. Phase two of the stone sutras project is marked by expansion, in many senses. Táng lín mentioned seven caves or "rooms" filled with sutras, though now there are nine in total. The scope of the project became to engrave the entire Buddhist Canon as it occurred at the time. This phase extended long after Jìngwǎn's death. Award winning Professor of Art History, Lothar Ledderose, characterises the new phase as "changing the audience". The first phase seems to have been aimed at living people. Leiyin cave was not sealed and was arranged as a kind of shrine so that people could come in and read the texts arrayed around the walls. The new caves were simply storage and not easily accessible. In the newer caves, the stone slabs were densely stacked together and Jìngwǎn left instructions not to disturb them unnecessarily. These make up about 5,000 of the almost 15,000 stone tablets associated with Yúnjū Temple (10,000 more were found buried in the Temple grounds). Once they were filled, each of the caves was sealed with a large stone door. However, it is clear that people, particularly Emperors, could not resist peaking from time to time (Li 109). Xuándǎo (玄導) became abbot and leader of the stone sutra project after Jìngwǎn's death, until his own death in 672. During his leadership, funds apparently ran low and Yúnjū Temple began accepting donations in return for engraving specific sutras. The earliest example of this happens also to be the earliest dated Heart Sutra, from 661. This program is similar in some ways to the Roman Catholic practice of selling indulgences. Lay people thought that by doing these pious acts they would secure a better rebirth or even liberation for themselves and their families. This led to many copies of the same sutras being created, though, presumably, the funds generated by selling indulgences went back into the main project. During the life of the stone sutra project, more than one hundred different sutras were engraved, including very long texts such as the Mahāprajñāpāramita-sūtra, the Mahāsaṃghata-sūtra, and the Mahāparinirvāṇa-sūtra. The latter covered 120 tablets on its own and was stored in its own cave, while the Mahāprajñāpāramitā Sūtra covered 1,500 tablets (Li 1979). However, multiple copies of some sutra texts make up many of the tablets (Yong 2010). Buddhists would once again undergo persecution in the late Tang, and a disruptive civil war in the Five Dynasties Era (907-960), but work on the stone sūtras did not completely halt until 1691. Of the 15,000 tablets, as many as 10,000 date from the Liao and Jin Periods and were buried in a pit in the monastery between 1117 and 1200 CE. 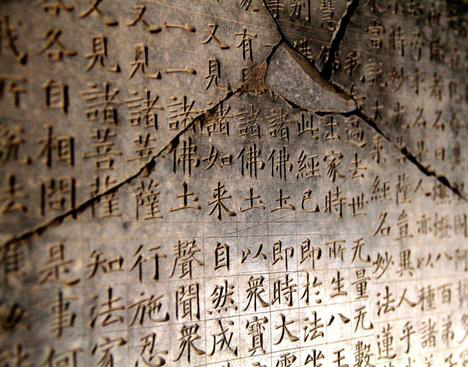 During the excavations in the 1950s, rubbings were made of the tablets, including the Xīnjīng tablet that is the earliest dated Heart Sutra. Slabs were engraved on both sides so that a total of 30,000 rubbings were made at the time. Rubbings of such tablets are made by spreading ink directly onto the stone and then pressing (rubbing) paper onto it, in a manner resembling lithographic printing. This, of course, produces a horizontally inverted negative image. A few facsimile images of these rubbings, printed reversed so that they could be read (including the Heart Sutra of interest), were printed in Zhōngguó... (1978) and the entire collection from Fángshān were published (in 30 volumes) by Zhōngguó... (2000). These publications are the main way that scholars can get access to the collection now (though there are no copies of the complete set in the United Kingdom, unfortunately). I thought it worth telling the story of Jìngwǎn and his stone sutra project in some detail, including as many names and dates as possible, because it is not well known in the West. This essay brings together facts that are scattered amongst many different publications that remain inaccessible to most people. This is despite the story being common knowledge amongst some Western archaeologists and art historians (since at least the 1970s), and amongst Chinese and Japanese Buddhism Studies scholars (since the 1930s), though modern studies of the collection begin 1914. Jìngwǎn's collection includes the earliest dated copy of the Heart Sutra and thus deserves a chapter in the history of the text. It also gives us a stronger sense of how the Heart Sutra was conceived of and used in its original context. That tiny minority of intellectuals who commented on the Heart Sutra as a text certainly did not see it as ineffable, while the vast majority (including the majority of Buddhist monks) saw it as having magical properties that did not depend on understanding. These properties could be activated, following the advice of other Mahāyāna Buddhist texts, merely by speaking it aloud or by writing it. Writing it in stone was seen as especially efficacious in China, perhaps because of the model of Emperor Asoka and his edicts. Gjertson, Donald E. (1989) Miraculous Retribution: A Study and Translation of T'ang Lin's Ming-pao chi. Berkeley Buddhist Studies Series; Centers for South and Southeast Asia Studies; University of California at Berkeley. Lancaster, Lewis R. (1989). 'The Rock Cut Canon in China: Findings at Fang-shan,' in The Buddhist Heritage, edited by Tadeusz Skorupski [Buddhica Britannica 1]. 143-156. Tring: The Institute for Buddhist Studies. Lee, Sonya S. (2010) 'Transmitting Buddhism to a Future Age: The Leiyin Cave at Fangshan and Cave-Temples with Stone Scriptures in Sixth-Century China.' Archives of Asian Art. Vol. 60 (2010), pp. 43-78. Nattier, Jan (1991). Once Upon a Future Time: Studies in a Buddhist Prophecy of Decline. Asian Humanities Press. Yong You. (2010) The Diamond Sutra in Chinese Culture. Buddha's Light Publishing. 中国佛教协会 (1978) ​「房山云居寺石经」. 北京 : 文物出版社. = Chinese Buddhist Association. (1978) Mount Fang, Yunju Temple, Stone Sutras. Beijing: Cultural Relics Publishing House. 中国佛教协会 and 中国佛教图书文 (eds) (2000) 「房山石经」（全30册）华夏出版社. = Chinese Buddhist Association and Chinese Buddhist Literature Museum (eds) (2000) Mount Fang Stone Sutras. Huaxia Publishing House.